There are many reasons for getting a piercing and a lot of positive things that come with getting one. They are unique, they make you feel good, they are appealing to look at, the list goes on. Thrown in there, though, are a handful of things that can go wrong. Most of which are preventable. Keloids and healing bumps are among those but people have a tough time telling the difference between the two. Let us help you out with that! Keloids are very firm scars that are usually pink to red in color. These clusters of excess scar tissue raise up above the skin and tend to grow larger and cover more surface area over time. They are sometimes called “a scar that doesn’t know when to stop” because the cellular information passed during the proliferation and inflammation stages in the healing process may be the culprit in this flaw. Keloid scars can be extremely itchy, tender when you place any sort of pressure on them and can be painful at times too. Keloids are usually genetic. 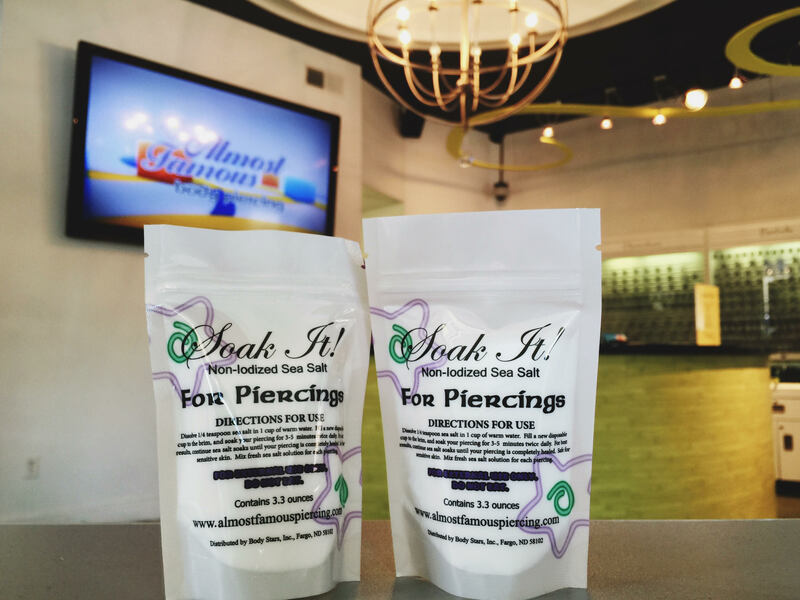 Before getting a piercing, you can always ask your immediate family if they have ever gotten a keloid from a piercing, after a surgery, or from a chickenpox or acne scar. Healing bumps are common and easy to get rid of. They can be found on any piercing but are most often found on nostril piercings and/or piercings on the ear. These bumps are filled with drainage, dead skin cells, and other wound debris that can become trapped from lack of aftercare or using things like Neosporin and Bacitracin. They are not super firm and are almost “fleshy” when you touch them. They may also fluctuate in size, starting very small and growing, then going back down again especially after soaking. Healing bumps indicate that the wound is unable to drain. They do not mean the piercing was done incorrectly, or that you are allergic to the jewelry. The fact that keloids tend to spread out and cover a larger area than the injury or wound itself is one of the easiest ways to tell the difference between the common healing bump and a keloid. A healing bump is a raised bump that typically just grows right above the piercing site. Healing bumps are generally skin colored and can be light pink while keloids look more like scars and can range from pink to a deep red. This article has some great information on what a scar is, why we scar, and some photos on the different types. If you’ve read through this and you’re still wondering whether you have a healing bump or a keloid scar, we welcome you to visit an Almost Famous Body Piercing location near you and visit with a piercing professional. That way, we can take a closer look and better assist you. Unfortunately, it is unlikely that one would be able to get rid of a keloid scar without the help of a plastic surgeon. Healing bumps, on the other hand, can be very easy to get rid of. It just takes some time and a consistent aftercare routine. For a healing bump, we would recommend our ‘Soak-It!” non-iodized sea salt and our “Wash-It!” glycerin soap. The sea salt is so important because it rinses out the inside of the piercing and pulls out the trapped drainage that started the healing bump in the first place. You want to soak it a minimum of three times a day with a maximum of ten times. You can also purchase Tea Tree Oil to help eliminate a healing bump. This can be applied topically and to your soak as well. There can be a lot of misinformation circulating when it comes to the difference between healing bumps and keloid scarring. That’s why we’re always here to help. We’re available by phone, email, messaging, and in person for questions on these subjects.